Ever wonder who’s behind your favorite Yep Roc releases? Every month we’ll introduce one Yep Roc employee with a personal Spotify playlist and a quirky caricature from our creative designer, Nathan Golub. 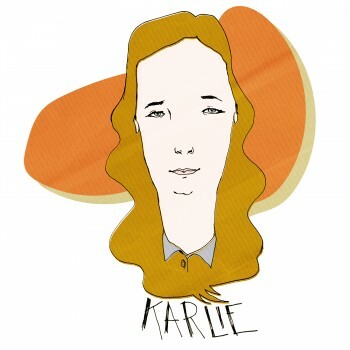 This month, we’re talking to Karlie Marlowe, Yep Roc’s Digital Marketing Manager. If you’re finding out about a Yep Roc artist through social media or the internet in general, Karlie had a hand in getting that information to you. What do you do behind the scenes? My team and I make sure that fans know what’s going on with their favorite artists, whether that’s via social media, email, or even places like iTunes or Amazon. We’re working with the people there to get our artists in front of eyeballs. What other kinds of social media and marketing have you done and what was it like? My first gig out of school was in the press office at the N.C. State Fair, back when social media for business was just starting out. I started the Fair’s Twitter before my personal one – and ran the Deep Fried Blog, which has a really awesome corndog header. I also worked at an advertising agency where one of my clients was a pet food company. I’ve been lucky to work at organizations and in industries where people love the things I’m telling them about – I mean, it doesn’t get much better than deep-fried food, cute puppies and music. What genre of music are you most passionate about? I would say country music, but I’d probably qualify that to people like Brandy Clark, Ashley Monroe, Pistol Annies and Sturgill Simpson. Country music can have a bad connotation, but I tend to leave honky-tonk and neo-traditional. I’m a product of the 90s, for sure. What shaped your music taste? My dad, for sure. He was in a honky tonk band in his twenties, just local bars around Western North Carolina. He has the best George Jones and Waylon Jennings concert stories from back in the late 70s and early 80s. The best one is probably one about Waylon Jennings after a show in Johnson City, TN. My dad and his friends were staying at the same hotel as the band, and they heard this loud noise. Turns out Waylon was trying to get a soda out of a vending machine and they helped him out. You can’t really have those kinds of interactions with many artists anymore, but a lot of what my team and I do is try to create those kinds of glimpses into the artists themselves and their art through digital channels like Instagram. What Yep Roc projects have you been most excited about? In addition to my work in digital marketing, I project-managed the Aoife O’Donovan and Tift Merritt records. I love some strong female voices in the Americana world. I just loved those records and working with those ladies. Also, the “Living In Raleigh Now” campaign with the International Bluegrass Music Association and Chatham County Line was a combination of one of my favorite bands, an awesome bluegrass event that Raleigh now hosts and the downtown Raleigh area, where I live. We bought that house in downtown Raleigh just a few months ago, so I’ve been busy decorating. It’s a nice creative outlet that doesn’t require a computer – other than the danger of online shopping. I grew up in Asheville, where traditional roots and string music is very popular, so a lot of my favorites now stem from growing up there before I moved to Raleigh 11 years ago. Those sounds are my favorite, and are featured on my playlist. Best interaction with a Yep Roc artist? At Americana Fest in Nashville 2 years ago, I was at the SiriusXM Outlaw Country studio on Broadway with our radio manager and I met Bobby Bare, the legendary songwriter. I was pretty star struck so I didn’t really talk to him much, but when he left the green room where we were waiting during a live interview said “Goodbye, pretty girl.” And I pretty much thought it was the most amazing thing ever. I’d say it’s a tie between Traveling Alone and Fossils. Not only because I worked on them, but it’s just music right up my alley. And I love the steel guitar. Volunteer more. And get my ears pierced a second time. Dave Alvin, for sure. I stood right in front of him the first time I ever saw him, after I started working at Yep Roc. He blew me away. If you were on a megabus for three days with one CD and a walkman, what would it be? Jamey Johnson, That Lonesome Sound. I latched on to that one via one of my favorite (and now-defunct) roots blogs The 9513, before it got a major release. He’s very much in the spirit of some of those outlaw-era legends, but in a very modern way that keeps the tradition of country music modern. And he has a very awesome beard. What’s in your car’s CD player right now? The Stray Birds’ Best Medicine, with “Feathers and Bone” on repeat; both the new and old Sturgill Simpson records; the new Lee Ann Womack record, The Way I’m Living; and the new Taylor Swift album. Now that she’s fully on the pop side I can fully embrace her. Spice Girls. At a K-Mart. That’s pretty embarrassing. If you had to be stuck in a submarine at the bottom of the Marianas Trench with one musician, who would it be? Sturgill Simpson, because his new record Metamodern Sounds in Country Music is such a weird combination of the traditional country music sounds I love with ramblings about metaphysics, religion and drugs.